Bing Mi! has been offering delicious authentic Chinese crepes, also known as jianbing, made and served from a quaint food truck in downtown Portland, Oregon, since 2015. From business people to students, people line up daily to get their fix of the delicious Chinese crepes, which are prepared fresh and made to order for breakfast or lunch at an affordable price. Bing Mi! offers a bit of authentic Chinese cuisine in Portland for all to enjoy. Chinese crepes, also known as jianbing, originate from the villages of Northern China. Believed to have first been made over 2,000 years ago during the Three Kingdoms period, the Chinese crepe was created when trying to feed an army that apparently lost all their woks. Without their woks, the army had to find an alternative way to prepare food. The jianbing was initially created using a flour and water dough mixture, which was spread over a shield. This shied was then held over a fire, which allowed the flour and water dough mixture to bake, creating the crepes that would become known as jianbing. These simple but flavorful crepes provided sustenance to the soldiers while they were in battle. Interested in seeing how the popular Chinese crepes jianbing are made? Stop by the Bing Mi! website to see an authentic jianbing being made from scratch. The menu at Bing Mi! is fairly simple. Customers can order their choice of jianbing prepared with the ingredients of their choice. 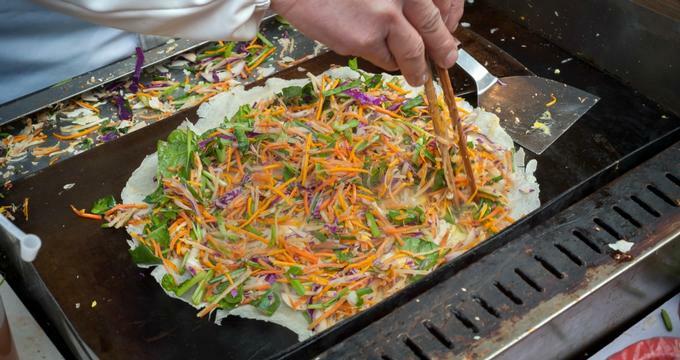 Typically, the jianbing is made with fresh scrambled egg, black bean paste, green onions, cilantro, pickled vegetables, chili sauce and a crispy fried wonton cracker rolled into a warm grilled crepe. Customers also have the option of adding additional ingredients, such as extra egg, extra wonton crackers, or sausage for breakfast jianbings. Hoisin and/or plum sauce can also be added for additional flavor. Bing Mi! offers water, jasmine tea, and several specialty drinks as well. Bing Mi! is expanding and is expecting to open a second location in 2017 at a food cart pod at 3405 SE 82nd Avenue near the corner of SE Powell. Prospective hours for this location will be Monday - Friday 7:30am - 3:00pm and Saturday 11:00am - 4:00pm. This location will have seating onsite for patrons to sit down and enjoy their Chinese crepes. Interested in learning more about Bing Mi!? Read about the various awards, reviews, and other information about the little food cart serving authentic Chinese crepes in Portland. From local reviews made by consumers to full article pieces about the success of Bing Mi!, there is plenty of news to be shared. For the latest information on Bing Mi!, visit their website.